It’s a classic american setting: the proud farmer gazing over his pasture, miles and miles of…seaweed? 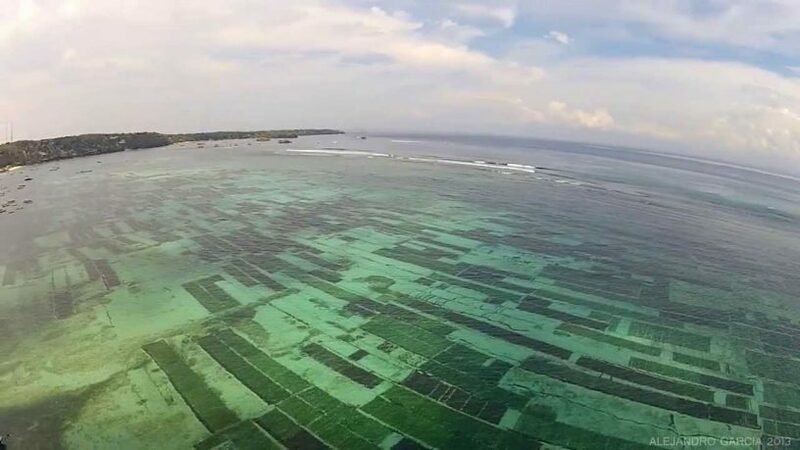 That is the dream for a growing cohort of entrepreneurs, who hope that seaweed aquaculture is the next big green business. These miracle algae have a wide variety of uses, but most importantly harvesting algae may actually slow ocean acidification. The demand for kelp and other seaweeds is growing, and the US cultivates millions of tons of dried seaweed annually, although that pales in comparison to China, who produce 45 times more than the US. In the wild, kelp grows in a sort of underwater forest. 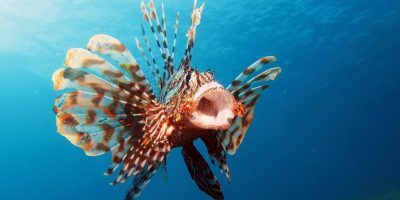 It provides cover for fish, homes for shellfish and food for everyone. Kelp grows exceptionally fast – some grow over two feet (60 cm) a day! Historically, seaweed was used all over the world. Foods like kombu (an edible kelp from Asia), lavar bread (a welsh creation) and sushi (nori is made from red algae) use algae. Besides food, the soda ash that is used in glassmaking is produced by burning kelp. Fertilizer, fish food, toothpaste and ice cream all use algae products. Algae could also be used in biofuels (including jet fuel!) , medicine and dental orthotics. One of the most interesting aspects of seaweed is its novel ability to reduce methane from livestock. Eating kombu and beans has been known to decrease flatulence in China and Korea for years, but researchers have found that if 3% of livestock feed is from certain seaweeds, methane is reduced by up to 80%. The effect is huge when you realize livestock produce roughly half the gases that vehicles do, or 5% of all greenhouse emissions. This reduction in methane is all due to bromoform, a compound that reacts with vitamin B12 to halve methane production. These seaweeds are not hard to grow. A typical crop requires planting, soil, watering, and fertilizer; algae can grow with nutrients already in the water. It can also absorb carbon dioxide, which is acidifying the oceans. Any harvested algae that is taken out of the water essentially removes CO2. 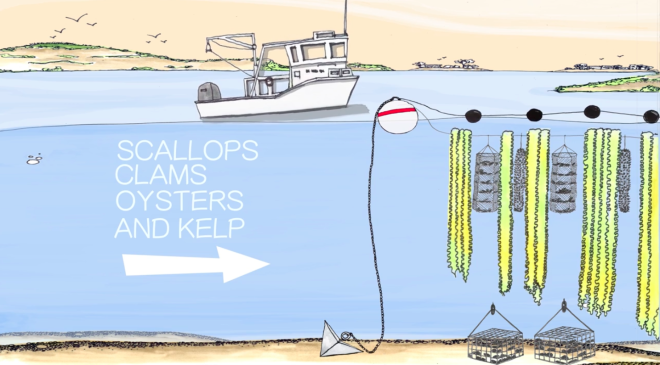 Kelp is fast growing, and supports shellfish and small fish in large forests. 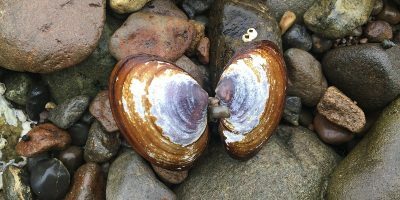 The crop can perfectly complement shellfish season, meaning shellfish aquaculture can continue producing year round. While conventional farming produces fertilizer runoff, algae farms can capitalize on the runoff. Coastal seafarms can sequester run off, prevent harmful algal blooms, and produce seaweed that can be mulched into a safer fertilizer. There are drawbacks to aquaculture, though. Some algae species can be highly invasive. The safest crops will be local species, but they may not be the most profitable. 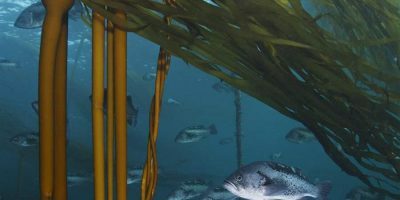 Although kelp can be grown in large vats safely removed from the ocean, this kind of operation is not cheap. Also, the most profitable seaweeds grow best in winter, which is not ideal for farmers. Lastly, seaweed can be an acquired taste, and is not one many Americans are used to. Still, farms are cropping up just like the greens they harvest. The iron and protein rich plants are increasingly common as a pairing for seafood, but can be found in protein shakes and smoothies too. All of these benefits from a “weed” could be the godsend a struggling ocean needs. While all the seafarms in the world won’t reverse the carbon emissions, the removal of CO2 in any amount is still a huge benefit. There are a number of economic incentives in place for a seaweed boom. Seafarms can take many forms, from actual plots on the seafloor, to shellfish farms or even deep roving mobile elevators. 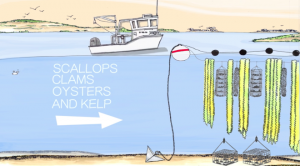 Kelp, algae and aquaculture may just save the ocean.